​​​​ DEL RIO, VAL VERDE COUNTY – A local aviation repair and service company recently moved into a newly built facility after more than a year of construction. 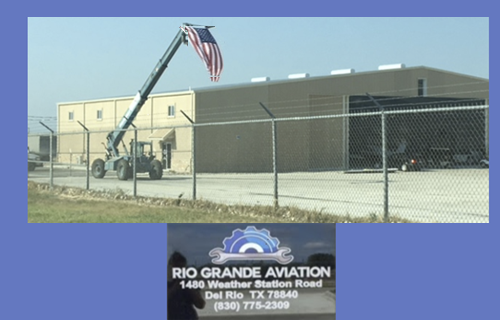 Thomas Mitchell, owner of Rio Grande Aviation, said construction for his company's hangar began in summer 2016 and was completed in August 2017. The 12,000-sf facility services most of the Del Rio International Airport's aircraft, Mitchell said. "We started eight years ago with a savings account and a tool box," Mitchell said. "I never really jumped at the idea of owning my own business until it just kind of happened." While flying commercially between San Antonio and Del Rio, Mitchell said he had the idea to start his own maintenance shop when he noticed the absence of one at Del Rio's airport. The hangar features insulation to keep the facility cool in Del Rio's summer heat, Mitchell said, and he had the concrete floors painted to give the hangar a clean look. When choosing a location to build, Mitchell said he wanted a spot that was accessible to both automobiles driving in from town and planes coming off the runway.